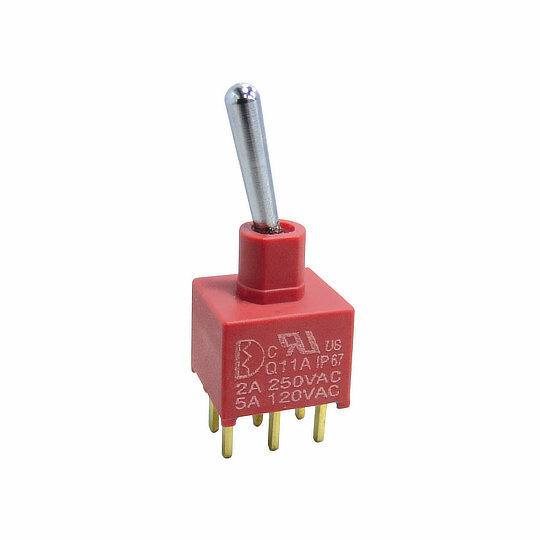 The 1A series of sealed miniature toggle switches from Dailywell are single, double or 3 pole switches with double throw operation and latching or momentary actions. Ideal for PCB mounting the 1A series comes with a choice of straight or 90 °angled PC thru-hole terminals with or without V-brackets, solder lugs or wire wrap terminals. Electrically rated to 5A at 120VAC/28VDC or 2A at 250VAC with silver/gold over silver contacts, or low level at 0.4VA at 20VAC/DC with gold contacts. The 1A series has been designed for both manual and wave soldering, is sealed to IP67 with a mechanical life of 30,000 cycles with a choice of metal or plastic actuators. The 1A series is perfect for applications such as Telecommunications, Instrumentation, Networking Equipment, Computer and Server Equipment, Medical Devices and Audio-Visual Equipment.